An Uber Eats Gift Card unlocks hundreds of local restaurants to enable food delivery of your favourite meal direct to your door. An Uber Eats digital Gift Cards is the gift of convenience meaning you can order take-away from the food delivery platform in just a few easy taps from your mobile phone. Uber Eats is a food delivery platform that makes getting great food from your favorite local restaurants easy. An Uber Eats Gift Card from Prezzee allows you to satisfy food cravings by offering food from restaurants you love, delivered directly to your door at home or at the office. Whether it’s Pizza, Mexican, Sushi, Poke, Chinese, Thai or Ice Cream - Uber Eats has you covered. 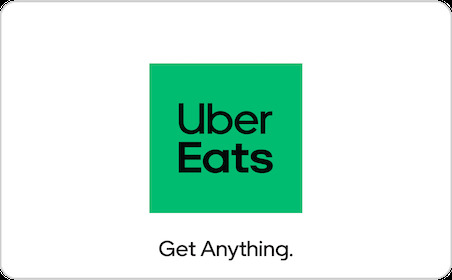 Uber Eats connects you with a broad range of local eateries, to give your favorite food delivered to your doorstep at the tap of a button. An Uber Eats Gift Card gives the choice of ordering from restaurants all over Australia and is easy to redeem. When ready to redeem the Uber Eats Gift Card all you have to do is simply open the app, scroll for inspiration or choose for a particular cuisine. When you find something to order, tap to add it to the basket. At check out, you’ll see the order summary - it’s at this point where you also enter the Gift Card unique code for redemption. You can use your gift voucher from via the Uber Eats app, or at eats.uber.com. The best thing about an Uber Eats Gift Card from Prezzee is that it is digital which means you can buy and send a Gift Card online in a matter of minutes. It’s the perfect gift for kids, sisters, brothers, friends, parents and colleagues because who doesn't love food! At Prezzee, we love gifting and everyday we are working to create easy and convenient ways that you can buy and send gift vouchers anywhere, any time. Do you also send Gift Cards for work? Then check out our Prezzee Business. Prezzee Business allows you to send hundreds of Gift Cards in a few easy steps and even customise it with co-branding options for the Gift Card you send to clients and customers.